The Super Cub’s simple appeals – ease of use, reliability and frugality – have never gone out of fashion. It’s why over 100 million have been made over the last 60 years. And also why, for 2019 it’s been reborn. The new Super Cub C125 is a stylish evolution of a revolutionary machine that’s worked so hard for so many over the last six decades. The riding position is straight-backed and gives excellent visibility, the seat uses high-density urethane foam for comfort and the handlebars are rubbermounted. Full LED lighting is a premium addition, as is the Honda Smart Key which controls the ignition and immobiliser from the rider’s pocket. The tubular steel frame, telescopic forks, twin rear shocks and cast aluminium 17-inch wheels rolling tubeless tyres, ensure confident handling. 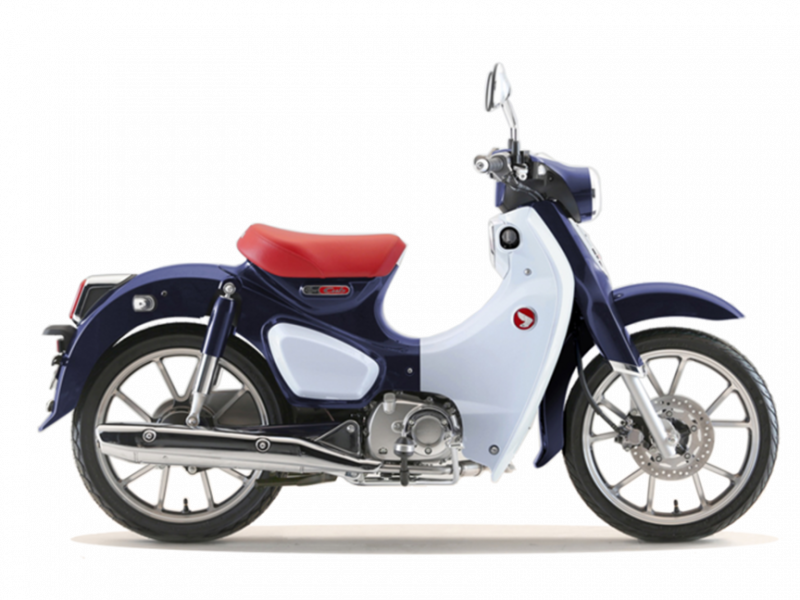 And its robust 125cc air-cooled, fuel-injected engine generates a smooth and linear power delivery. It’s also fuel efficient, returning 41.4 miles per litre (WMTC mode). And just like the original, an automatic centrifugal clutch makes operating the four-speed gearbox twist-and-go simple. PCP Terms and Conditions: New retail CUB 125 orders from 01 April 2019 to 31 July 2019 and registered by 31 July 2019. Subject to model and colour availability. Offers applicable at participating dealers and are at the promoter's absolute discretion (excluding Channel Islands). Representative example based on years 6.9%% PCP. Excess mileage rate applies. You do not have to pay the Final Payment if you return the bike at the end of the agreement and you have paid all other amounts due, the bike is in good condition and has been serviced in accordance with the Honda service book and the maximum annual mileage of 4,000 has not been exceeded. Excess mileage rate applies should this be exceeded. Indemnities may be required in certain circumstances. Finance is only available to persons aged 18 or over, subject to status. All figures are correct at time of publication but may be subject to change. Honda Franchise Dealers are credit brokers, not lenders. Credit provided by Honda Finance Europe Plc. Cain Road, Bracknell, Berkshire RG12 1HL. Honda Financial Services is a trading name of Honda Finance Europe Plc. a company registered at Companies House No 03289418. Honda Finance Europe plc is authorised and regulated by the Financial Conduct Authority, Financial Services Register number 312541.